As discussed earlier, the supply of mortgage-backed securities (MBS) continues to fall behind the potential demand - even with the Fed's taper in place. 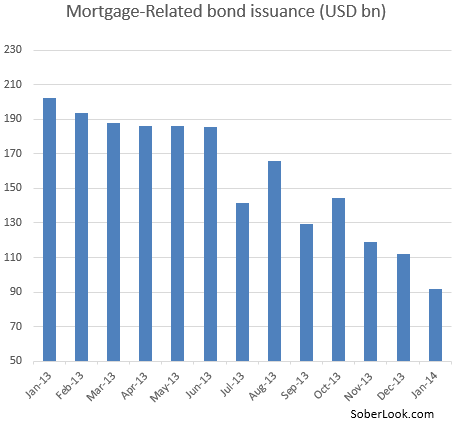 New issuance has steadily declined over the past year, with the Fed becoming an increasingly larger proportion of that market. Mortgage Daily: - For nine straight months, agency issuance of mortgage-backed securities has moved lower -- though there was an uptick at the Government National Mortgage Association. Securitization volume now stands at its lowest level in more than two-and-a-half years. Combined issuance of fixed-rate MBS at the Federal National Mortgage Association, the Federal Home Loan Mortgage Corp. and Ginnie Mae totaled 7 percent less in January than in December. Securitizations have been lower each month since April 2013, has fallen by more than half compared to January 2013 and was the lowest since July 2011. At the same time the Fed is to continue purchasing large amounts of this paper through the end of the year, albeit at a slower pace. 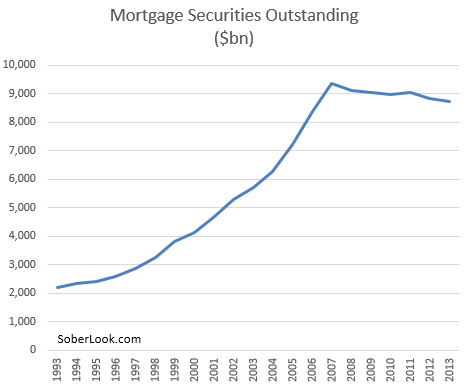 Some of the decline in new issuance has been due to the drop in mortgage refinancing - old securities don't amortize as quickly and fewer new securities are issued. 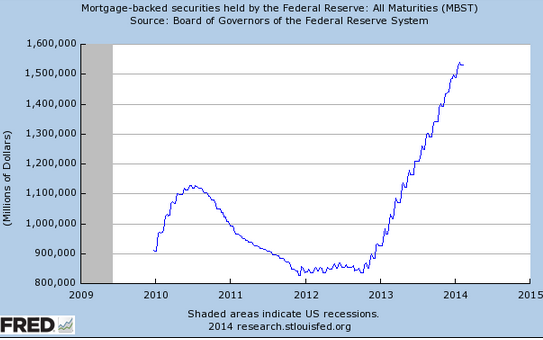 But part of the reason for the lower volume of these securities remains the supply of mortgage loans. 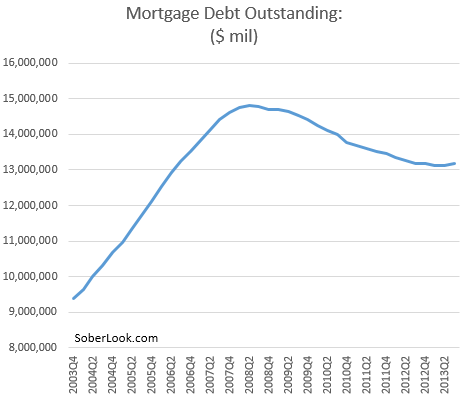 The total mortgage debt outstanding is barely growing - with a great deal of that growth coming from multi-family residence (apartment) financing. As a consequence, MBS paper outstanding has been shrinking since the peak reached back in 2007. Some of that of course is due to the collapse in private label MBS market, including sub-prime. But the amount of agency (government-backed) MBS has not grown much either. While some would say that $9 trillion of MBS paper should be sufficient, one has to keep in mind that the US and the global economy is now substantially larger than it was in 2007. MBS, particularly agency bonds, are becoming a smaller portion of the overall capital markets, worsening the shortage of higher quality bonds (see story). Liquidity in that market has also suffered, with average daily trading volumes at the lowest levels in nearly a decade (see chart). These are some of the reasons the Fed should return the MBS market to the private sector by exiting its purchases as soon as possible.